The Kentucky Baptist Fellowship (KBF) partners with the Eglise Evangelique au Maroc (EEAM). The EEAM is the legally recognized Protestant Church in Morocco. EEAM churches are spread throughout the Muslim nation of Morocco to provide a community for individuals living in Morocco that are Christian. 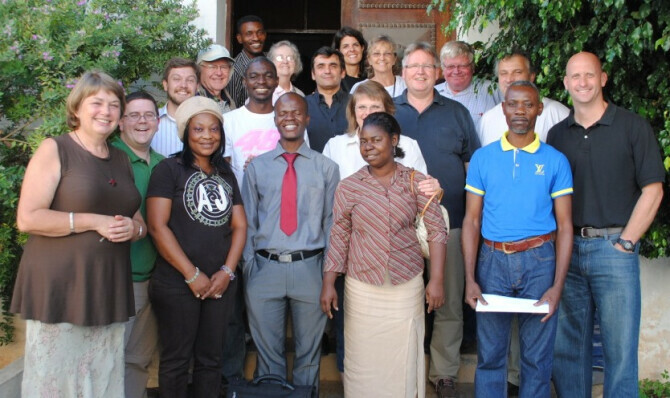 The EEAM has a benevolent arm of the church called CEI (International Aid Committee). First Baptist Church has joined the partnership with KBF and EEAM to support the work of CEI in Oujda. Oujda is located on the eastern border of Morocco next to Algeria. Migrants and refugees arrive from Sub-Saharan countries fleeing violence, famine, and many other tragic circumstances seeking a healthier and more prosperous future. Many of the migrants are hoping to pass through Morocco on their way to Europe, but this passage is treacherous and filled with complexities. Humanitarian The humanitarian assistance project is centered on individual interviews. Every week over 90 people are interviewed by team members to ascertain the most pressing needs, the most vulnerable cases. The project aids refugees and migrants with food, clothes, blankets, temporary emergency housing, short-term studies, judicial assistance, provisions for newborns and their mothers, funeral costs, and bibles upon request. People are also assisted with obtaining country identity and consulate cards, obtaining and mailing birth certificates, and paying police fees. On occasion, CEI has been able to assist migrants in returning to their home countries. Micro-projects Refugee and migrant’s inability to work in Morocco leaves them unable to provide for themselves and their families. It also contributes to depression and hopelessness. In their home countries they worked in a variety of fields, as everything from artists, to professors, to mechanics, to accountants, just to name a few. Since the activation of CEI two years ago, over 200 micro-enterprise projects have been started, in such areas as dried fish, electronic repair, shoe repair, hair cutting, baking, food preparation, small commerce, plumbing, and others. Although refugees and migrants cannot work within the Moroccan community, they are able to have small enterprises within the refugee/migrant community, and from these enterprises they can generate a small amount of revenue to help pay for food and shelter. Along with the monetary benefit, they experience a renewed sense of hope. To a certain degree, micro-projects allow refugees and migrants to take control of their lives. Scholarships One of the most hopeful aspects of CEI’s work is in the area of student scholarships. Many students come to North Africa legally, with financial support, to study at one of the many universities. Oftentimes, however, due to instability in their home countries, deaths of family members, etc, the funds run out. When they do, the students are unable to pay their educational fees, they cannot renew their student visas, and they become illegal. Some of the “best and brightest” are stranded here—unable to finish their studies and return home with a vision to lead their countries. CEI’s scholarships reflect a long-term solution to the migration problem—the development of the countries of origin. After completing the comprehensive selection process the students are chosen. Africa loses thousands of skilled workers a year to developed countries. CEI believes that by ensuring that the future leaders of Africa have the opportunity to grow and learn, the stage is set for them to lead their own countries to a better future—a future of faith, of freedom, of peace, and of economic possibility. As the future unfolds, CEI will continue to expand its outreach to the migrant population in Morocco in a variety of ways. The medical team has begun developing public health seminars on issues particularly pertinent to migrants, such as tuberculosis, AIDS, etc. Already, two new projects are in place to encourage and take advantage of the many gifts and talents of the people. A CEI drama and music group has written and performed a dramatic piece depicting the migrant journey to arrive in North Africa. A group of 8 migrant and refugee artists have had the opportunity, through CEI’s support, to attend three art exhibitions. The future for African refugees and migrants is uncertain, but, as long as there is a need, CEI will be there to be a beacon of light in the dark unknown.